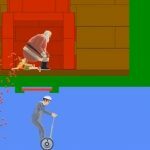 This week the blood flows as freely as ever with gamers across the globe uploading their Happy Wheels exploits for you viewing pleasure. The splatter that matters continues as level makers design ever-more fiendish ways of dishing out your demise. As usual the most popular release this week came from the irrepressable Jacksepticeye with way over a million views. The cacophonic Dashie was also popular as he rants through another set of levels. A couple of new ones for Happy Wheels videos were Bashurverse and MessYourself, you can see what you think of their efforts below. Visit the official site (some updates) for the latest news or play play Happy Wheels.